The ITW Delfast group designs and produces engineered plastic and metal fasteners for the automotive industry. The plastic fasteners typically are secured by a clip snapping into contact with a serrated shaft. 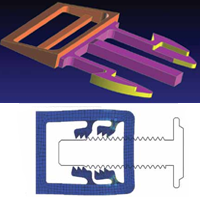 These fasteners present a difficult design challenge because of the complexity involved in multiple contacting bodies undergoing large deformations with sliding contact. Ostergren and MSC worked together to develop a template that provides a high level of automation while enabling users to interact with the analysis in order to ensure that it accurately represents the current design. The template fully automates the process of defining and naming parts and properties, generating symmetry constraints, defining contact bodies, load set generation, analysis setup, job submission and report generation.